A top Chinese Catholic official has retreated from comments widely viewed as hinting at a thaw toward the Vatican, clarifying that the Holy See must first cut ties with Taiwan, state media said Thursday. 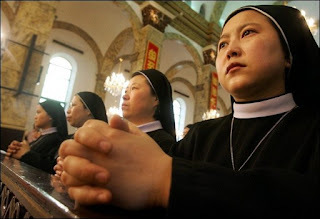 Liu Bainian, vice president of the Chinese Patriotic Catholic Association, had expressed his hope in an Italian newspaper interview this week that the pope could someday visit China to hold mass for the country's faithful. But Liu now says his comments were taken out of context, the China Daily reported. Before any papal visit, the two sides must first normalise long-severed relations, which cannot happen as long as the Holy See maintains official ties with Beijing's rival Taiwan, Liu told the paper on Wednesday. "What I meant was I hoped the pope could visit China and celebrate mass but only after normalisation of diplomatic ties," Liu said. "If the two issues can be resolved properly, the two sides will have favourable conditions to improve ties." Beijing and the Vatican have been at loggerheads since China severed ties in 1951 after the Vatican recognised Taiwan, where the papal envoy had fled a year earlier. The atmosphere worsened in 1957 when China set up its own Catholic church administered by the atheist communist government. China-Vatican ties came under the spotlight again last month with a letter by Pope Benedict XVI to the estimated 10 million Chinese Catholics loyal to the Holy See. It said Beijing must respect the religious freedoms of Catholics but notably omitted past Vatican attacks against Chinese communism. In his subsequent interview with the Italian newspaper La Repubblica, Liu said: "I hope with all my strength to be able to see the pope one day here in Beijing, celebrating mass for us Chinese." The comments, combined with the pope's letter, stoked speculation of a rapprochement. But Liu's clarification was underlined in an editorial in the China Daily. "The papal visit Liu had envisaged will not happen until the Vatican officially retracts its diplomatic recognition of Taiwan and commits to non-interference in Chinese affairs," it said.